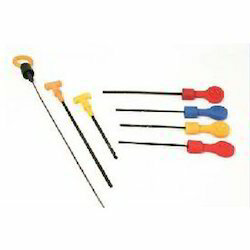 Automotive Oil Dip Sticks are used in various automobile industries to find the level of oil. These are fabricated using high quality materials and using advanced machinery. These are available in various sizes and dimensions that are specified by our clients. Clients can avail these at nominal prices in the market. Our range of these sticks is widely appreciated for their quality and performance. The instant invention also provides an efficient and economical method for assembling the handle member, sealing sleeve and cap. We utilize high grade material to manufacture our range of Dip Sticks, which we source from reliable vendors. Looking for Oil Dip Sticks ?